Medication or drug therapy is the most common treatment for ischemic stroke. Thrombolytic medications such as tissue plasminogen activator (t-PA) are used to treat an on-going, acute ischemic stroke caused by an artery blockage. These drugs halt the stroke by dissolving the blood clot that is blocking blood flow to the brain. Thrombolytic therapy cannot be used until the doctor can confidently diagnose the patient as suffering from an ischemic stroke because this treatment might increase bleeding and could make a haemorrhagic stroke worse. 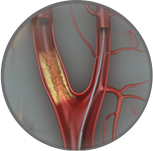 If your stroke care team determines that there is a blockage in the carotid arteries a procedure called Carotid Artery Stenting may be recommended. Carotid Artery Stenting is a minimally invasive medical procedure to treat narrowed or blocked carotid arteries, the arteries in the neck that supply blood to the head. 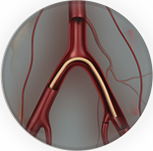 This procedure may be performed on an emergency basis following a mini-stroke or a stroke. The goal of treatment for a haemorrhagic stroke is to control bleeding, prevent pressure build up in the brain, and to stabilize the patient’s vital signs. Close monitoring of the patient’s neurological status is indicated. Medications to control blood pressure, seizures, and swelling may be administered depending on the particular situation. If a ruptured aneurysm is determined to be the cause of the haemorrhagic stroke, your health care team may recommend endovascular embolization. Endovascular embolization is a minimally invasive procedure that is an alternative to surgery for the repair of brain aneurysms. Carotid endarterectomy is a surgical procedure in which a doctor removes fatty deposits (plaque) from the inside of one of the carotid arteries, which are located in the neck and are the main suppliers of blood to the brain. Microvascular Clipping involves cutting off the flow of blood to the brain aneurysm by applying a clip to the neck or base of the aneurysm. 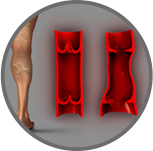 Arterial Occlusion involves the surgeon clamping off (occluding) the entire artery that leads to the aneurysm. You can help prevent stroke by eating a healthy diet, getting enough exercise, avoid smoking, limiting alcohol and managing underlying health conditions such as high blood pressure, cholesterol and diabetes.